Please note Woodberry do not deliver to residential addresses. Woodberry contract deliveries to a national pallet distribution network. 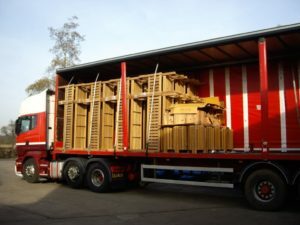 This means, that your delivery will arrive on a pallet in a large delivery vehicle (18 ton lorry), with a tail-lift, so the driver will drop the pallet off either at the kerbside or in your front drive. The driver will not be able to take the goods across stones or shingle, neither will he take it into the back garden. He will only be covered by insurance to deliver the pallet within 3m of the back of the truck. However, sometimes, if the driver is willing he may take it further than this for you. In the event of parked cars restricting access, the delivery driver can only be expected to unload the goods as near as he reasonably can. If no-one is around to take delivery at the pre-arranged date or time, Woodberry reserves the right to charge the customer for an aborted delivery (£55 per pallet). Any changes to delivery date / time must be made 24 hours prior to delivery, less than this an additional delivery charge may be made. Day specific deliveries are at no additional charge – this is between the hours of 08:00 and 17:00 dependant on traffic conditions on the day. Timed deliveries can be arranged, this is an additional £15, and if you need to know an ETA, then Woodberry can only gain an ETA within a 2 hour window as the driver will have other deliveries on his vehicle, and may not know how long he is going to be at other deliveries. You are of course, free to arrange your own collection from our warehouse , visit our contact page. Woodberry’s standard lead time from date of order is 1-2 weeks. This is subject to the necessary clearance being given such as cleared funds or receipt of an official purchase order number. If you would like us to deliver and install your furniture, using our trained fitters, then please call 01926 889922 to discuss this with us. This service may incur an extra charge and would be looked at on a job-by-job basis. Deliveries are made on the acceptance of these points. Woodberry of Leamington Spa, Bericote Wood Yard, Bericote Road, Blackdown, Leamington Spa, CV32 6QP.